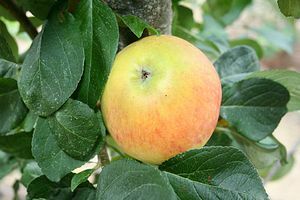 Baker's Delicious - Apple Tree £15.75 - Dessert Apples - Mid Season Apple Trees and Fruit Trees For Sale. Buy at competitive prices with wholesale discounts. This is a relatively rare eating variety that was found in Wales in 1932. A crisp, juicy and sweet apple with a nice balance of acidity, it is an excellent second-early variety that can be eaten straight from the tree from late August/early September. We all agree at the nursury that there is a delicate apricot flavour from this apple. The fruit is known for it's flushed bright orange red over gold appearance and as a hardy variety it's a good choice for planting in colder or exposed areas.